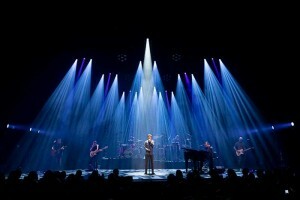 Belgium – Belgian TV presenter and singer Niels Destadsbader teamed up with composer, pianist and music producer Miguel Wiels in a special ‘Niels & Wiels’ duo to present four exclusive concert performances for which they wanted a unique show design that captured the essence of the collaboration. 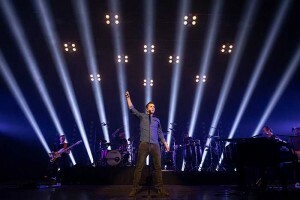 The two, who are also great personal friends, and their respective managements asked Genk-based creative practice Painting with Light to create some visual magic for the show, and Luc Peumans led the project for Painting with Light. A photo of the two artists which they both really liked gave Luc inspiration to kick off the stage design. (There is a striking resemblance even though they are not related.) Luc didn’t want to use LED screen, so instead he had the photo printed as a large backdrop which could fly in and out. All the venues were theatres and offered house bar flying facilities. 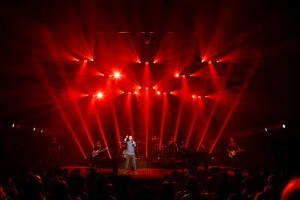 He then built a basic architecture for the stage space with various lighting fixtures. Choosing the extremely distinctive and slightly retro look of the Portman P2 Hexaline to create an upstage wall of luminosity, Luc positioned 24 bars upstage, just in front of the printed backdrop, each one offering six individually controllable 230W halogen bulbs complete with hexagonal reflectors and housing. 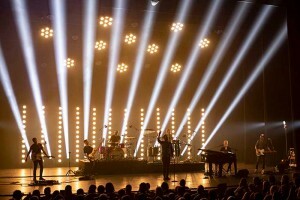 The Hexlines had several key positions and shapes which changed the performance space simply and elegantly through the show. Above the stage were ten Portman P1 fixtures which complemented the Hexlines perfectly. These are another gem from the Polish company, featuring a central 230W halogen in hexagonal reflector surrounded by six others giving a flower-like effect with perfect geometry, and all the characteristics of tungsten that LDs know and love, packaged in contemporary housings which make them ideal for this style of scenographic lighting. 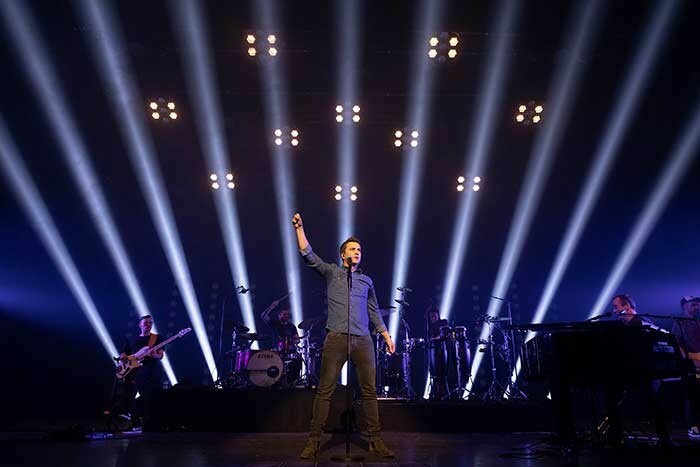 These fixtures were the straightforward yet dynamic base design and fulfilled Luc’s desire to present a stage look that is strongly independent of video but with some core ‘mappable’ characteristics that combined theatricality with invention. Luc likes the Portmans for the atmosphere they bring to any environment, because they are attractive to look at and their effects are gentle and delicate, opposed to being harsh, aggressive and full-on. “It’s about capturing the spirit of the show,” he comments. For the rest of the lighting rig, Luc chose Chauvet fixtures. On the ground were 11 Maverick Mk1 hybrid moving lights, picked for their beam effects, brightness and big front lens. 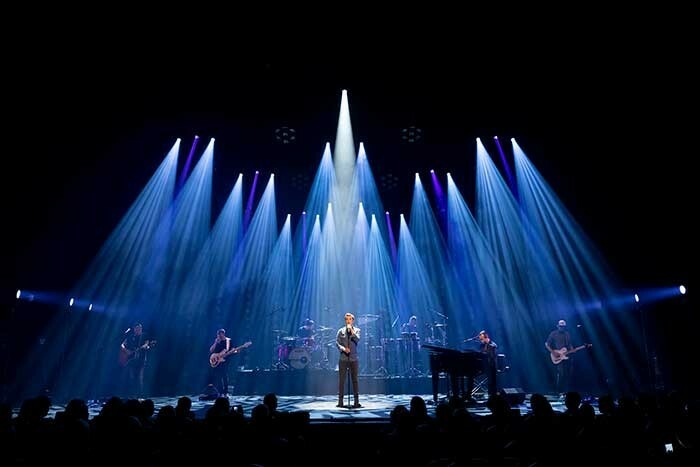 For side lighting, three two-metre high stands per side were rigged with Chauvet Rogue R2 Washes at the top, placed in the optimum positions to light Niels’ backing band. Overhead, in addition to the ten P1s, were ten lighting pods, each populated with two Maverick Mk2 Spots and ten Maverick Mk3 LED Washes, primarily used for backlighting and assorted effects like gobos, etc. 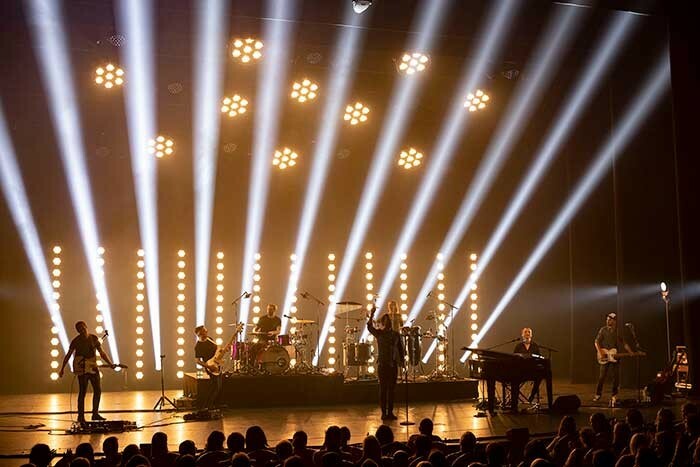 The Maverick Mk3s had each one of their 27 x 40W LEDs pixel mapped, allowing programmer Jeroen Opsteyn and lighting director on the road Kristof De Dycker (Niels’ regular operator) to create a diversity of looks and interactions with the P1s. Show director Frank Van Laecke was also well prepped, enabling the whole team to work together quickly and maximise the time and productivity during the on-site production day, which was used for fine-tuning and calibrating the details.